Are you sick of eating baguette for breakfast, ramen for lunch, and mac’n cheese for dinner? So am I. There is no need for good food to be difficult, nor for it to be expensive. Here are some basic recipes that you can use to feed yourself or impress someone else. Well, maybe not impress, but at least it looks like you know how to cook. Preheat oven to 200°C (if you actually have one). Chop potato(es) into about quarter sized pieces. Simultaneously heat up the olive oil on medium heat in a pan with tall sides. When the oil is hot, place the potato slices in the pan, making sure that they aren't stacked up. When one side of the potato slices darken, flip them over. Dice two medium-sized onions or three small-sized onions, and chop mushrooms into small chunks. Once both sides of the potato slices have darkened, add the onions and mushrooms. Actively stir the onions until they look translucent, and the mushrooms look darker. Add as much spinach as you want, since spinach has an infinite shrinking ability. Next, add one teaspoon of salt, as well as the goat cheese. Crack the eggs into a bowl and add one tablespoon of paprika, one tablespoon of chili pepper, a pinch of pepper and one teaspoon of salt. Beat the eggs until everything is properly mixed. Pour the eggs into the pan, making sure the eggs are spread out equally: you can do this by tilting the pan to the sides. Cook for about five to seven minutes over medium heat until only the top is runny. If you are fancy and have an oven, move the pan into the oven (that you preheated at 200°C) for five to seven minutes. If you live in a Parisian closet space and don't have an oven, cook everything until it is only slightly runny. Next, grab a plate, place it on the pan, and flip. 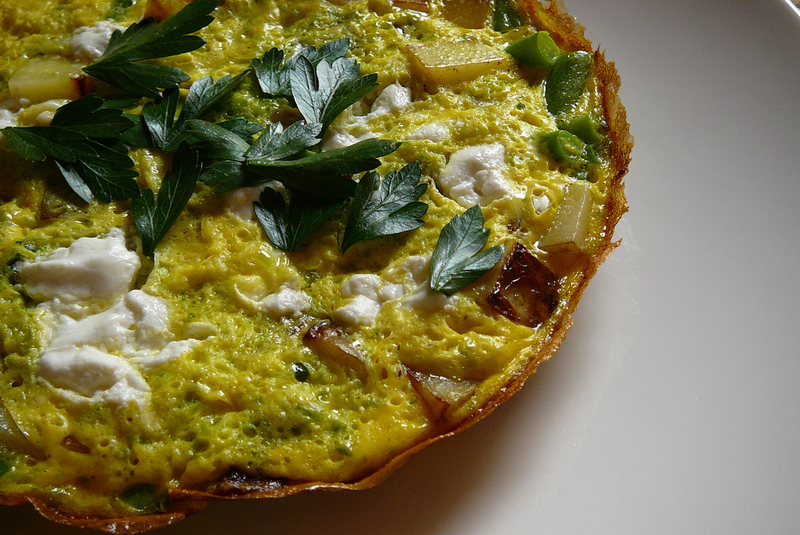 Put the pan back on the stove and slide the upside down frittata back into the pan for two to four minutes. Breakfast is ready. If you want to spice it up, add sriracha mayonnaise or garlic aioli. In a different bowl, beat together eggs, milk, and vanilla. Add the contents of the two bowls together. Mix in three tablespoons of melted butter. Heat the pan of a medium heat and melt some butter in the pan (for each crepe unless there is some left from the last). Pour a big soup spoon of batter into the pan, tilting the pan making sure that the batter spreads out evenly over the whole pan. When bubbles start forming in the center of the crepe and the edges look dry, flip the crepe. You can do this with a spatula. The other side shouldn't take as long, but keep an eye on it by lifting up one of the edges and peeking underneath. 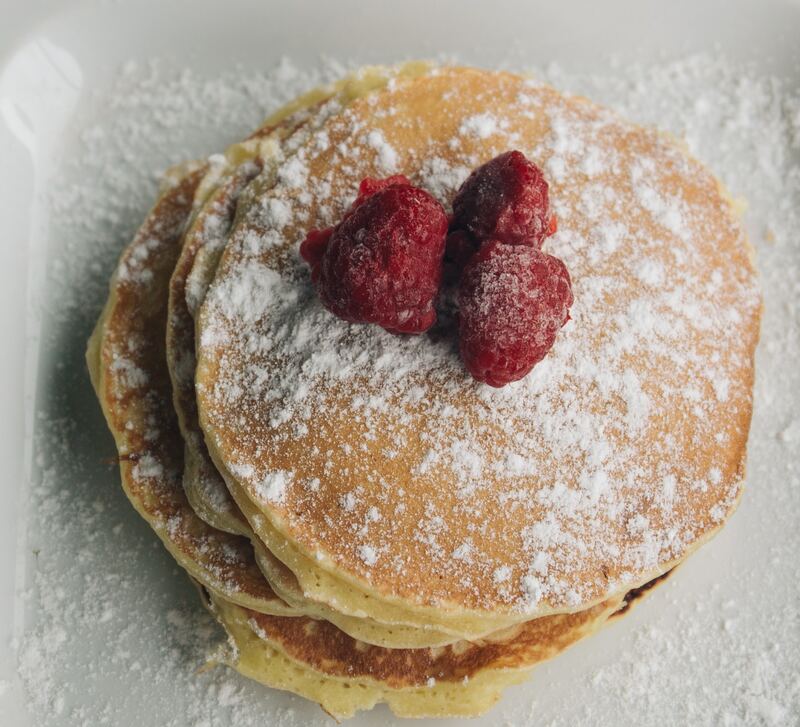 Your first crepe will most likely be the experimental one; use it to assess the amount of batter each crepe needs, as well as to see if the heat of your pan is ok. Serve plain or with Nutella, fresh fruit, sugar, cinnamon and sugar, or make it a savory crepe by adding cheese, mushrooms, ham or other tasty goods. Bring salted water to a boil and cook the orzo pasta for the amount stated on the box. While your pasta is cooking, heat up a pan and add olive oil. Chop the five garlic cloves into small pieces, and add it to the pan with olive oil. Just as the garlic begins to turn golden, add the bag of spinach (two bags if you really like it or want more protein). The pan will look full, but spinach shrinks down. 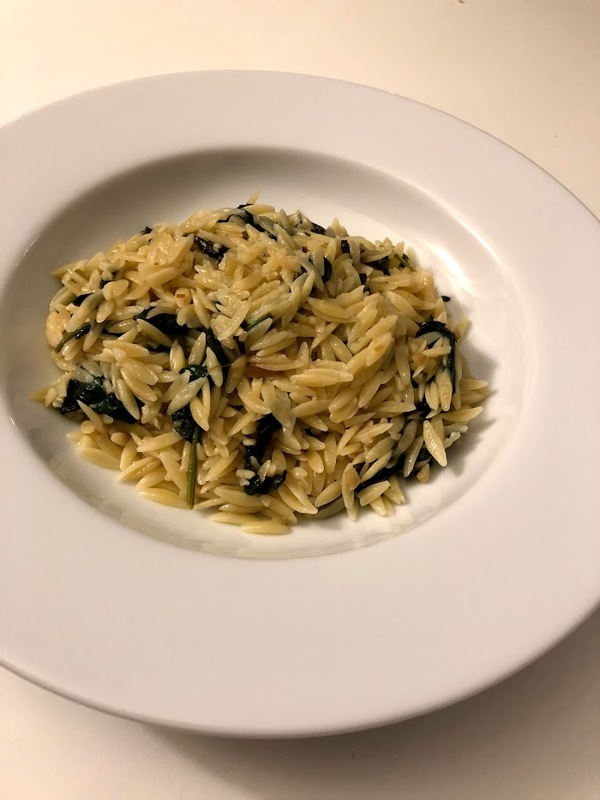 Once the spinach has cooked down add the orzo pasta to the pan and mix everything. Add as much salt as is your personal preference. Once everything is properly mixed, your meal is ready. Heat the oil in a pan. Meanwhile, chop the potato(es) in small pieces. Once the pan has heated up, add the potato pieces and add only half a tablespoon of cumin, garam masala, turmeric, and chili powder. Stir until the potatoes turn brown, then place the potatoes aside in a bowl, leaving the oil in the pan. If you are unsure whether there is enough oil, add another tablespoon. Finely chop the peeled garlic and ginger and add to the pan. Once the garlic and ginger have been cooking for about a minute or two, add the chopped onions. When the onions look translucent, add 1 tablespoon of salt, cumin, garam masala, turmeric, and chili powder. Add the chopped tomatoes to the pan, together with the drained and rinsed chickpeas. When the tomatoes look almost cooked, add the spinach. 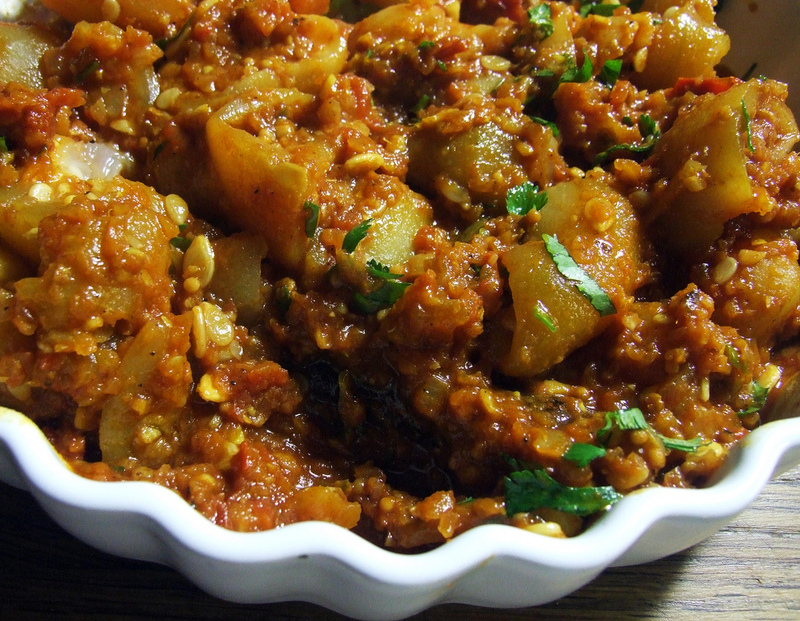 Once the vegetables are well-mixed, add the tomato puree, tomato paste, and the potato pieces. Chop up half of the cilantro (coriander), add it in, and stir everything together. Cook everything for about 30-35 minutes and stir every so often. While you are doing this, start cooking the rice. 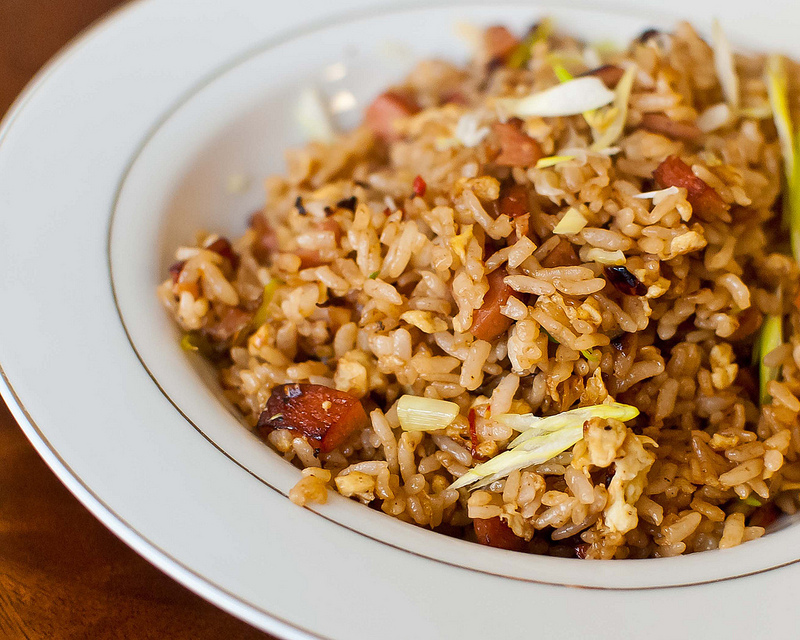 Once the rice is cooked and the vegetables are ready, place the rice on a plate and pour the vegetables and sauce over the rice. Chop the onions, mushrooms, and broccoli while bringing the pan and oil to a medium heat. Once the oil is heated add the three ingredients into the pan. Prepare the snow peas by cutting off the tips and chop each one into three sections. Add to the pan with the rest of the vegetables. Once the vegetables looked decently cooked, scramble the eggs in a bowl. In the pan, create a circle in the middle, using the vegetables as the circle's sides. Pour the egg into the circle and continually stir (in the circle) until the eggs are fully cooked. Then stir the egg in with the rest of the vegetables. Add the cooked rice to the rest of the vegetables and stir, adding the two to three tablespoons of soy sauce (depending on preference). Cook for another two to three minutes over a medium heat. Serve with chopped greens onions as a garnish (optional). Take the crust and put it in the tart tin, carefully pressing the crust into the sides of the pan. Place the pie tin into the fridge while you prepare the apples. Peel and cut the apples into thin slices. Mix the apples with the sugar, the juice of half a lemon and a tablespoon of cinnamon. Melt the butter in a pan at a medium heat and add the apple mixture once the butter has melted, and cook until the apples begin to caramelize and are almost mushy. 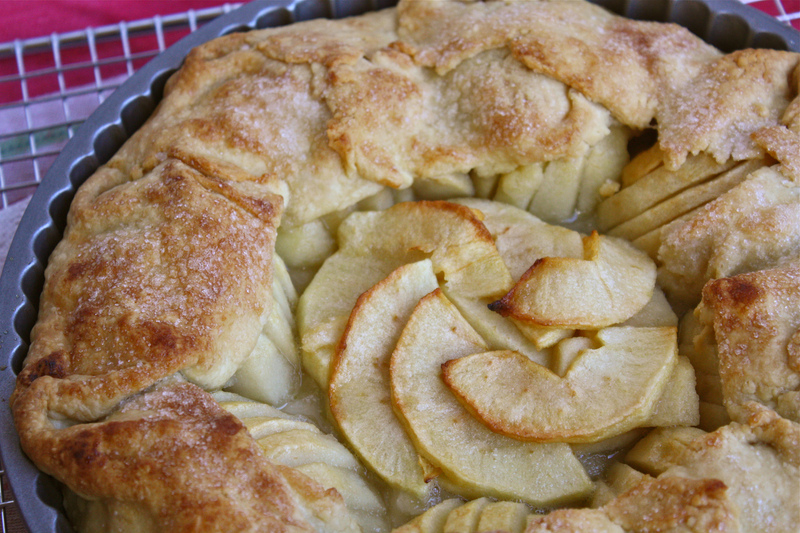 Place the apples into the pie tin, and cook it in the oven for about 35-40 minutes. The pie is ready if the crust is a very light brown. Serve plain, with whipped cream or with vanilla ice cream. Et Voila! Now you know how to make these basic meals and pretend to be adulting.